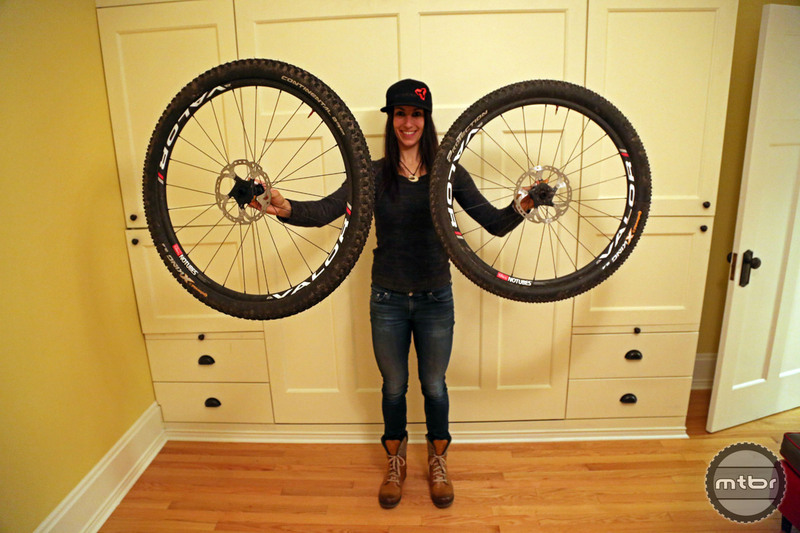 Sonya doesn’t discriminate, giving love to both popular MTB wheel sizes. Does size really matter? If we’re talking mountain bike wheels, my answer is, it depends. I’ve had the luxury of riding a few different 29ers and 27.5s with varying travel sizes and geometries. I like them both. Currently, my main weapon for cross country is the Scott Spark (29er and 27.5). For enduro/trail riding it’s the Scott Genius (27.5). I solely rode 29ers for years because at the time my bike sponsor only offered 29ers. But in the last couple years, the brands I’ve been associated with have offered a variety of bike choices. 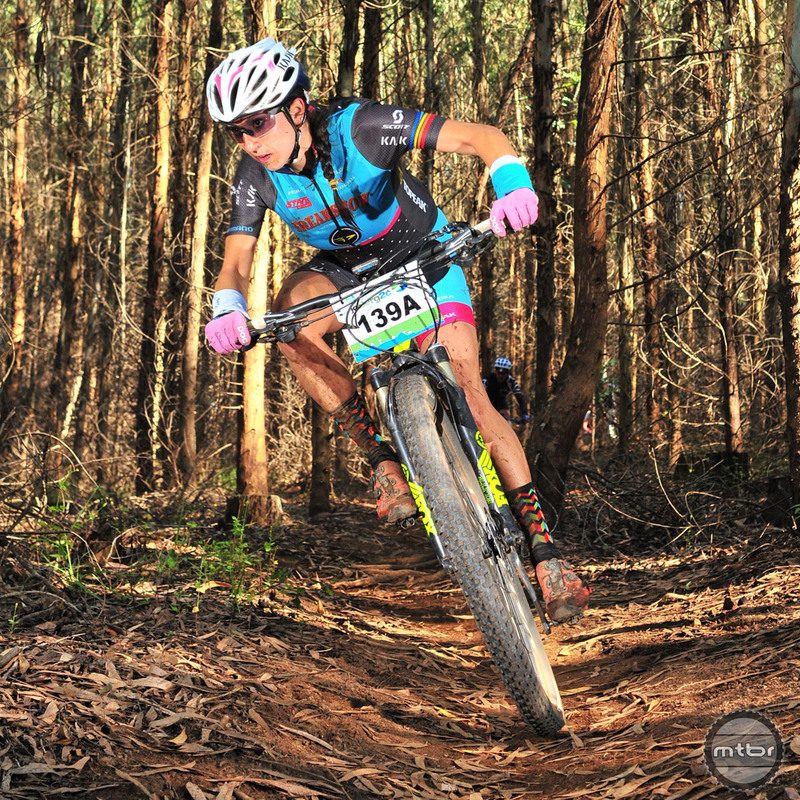 When the XC race number is on the front of the bike, 29er is the choice. As someone who had been on a 29er for a long time, I admit I was skeptical as to whether I’d like 27.5. The truth is after riding both options I love both wheels sizes. They feel really different. 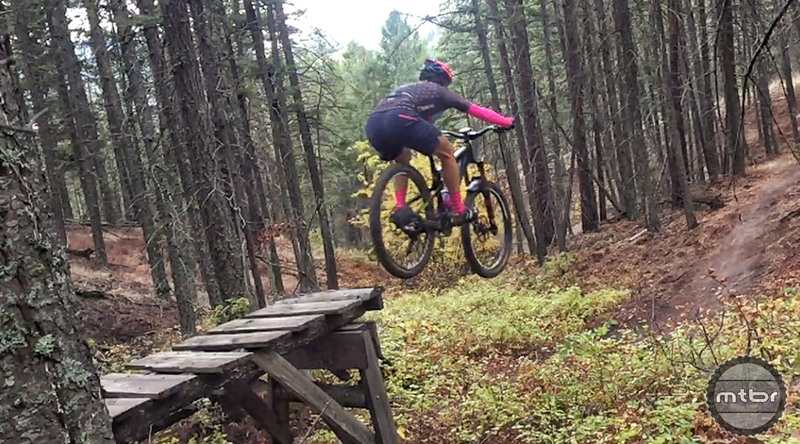 For reference, I’m 5’7”, and while I’ve heard arguments that smaller riders may prefer smaller wheel sizes, I’ve seen plenty of very small women rip it up on 29ers. That said, I think it all boils down to the terrain you are primarily riding. I lived in Colorado for nearly a decade and rode thousands of miles on trails around the Southwest. Most of those trails weren’t particularly twisty or crazy technical. Honestly, I didn’t know what crazy technical meant until I moved to British Columbia. My opinion of wheel size and even the way I set up my bikes completely changed. So what’s the answer to this ever-lasting debate? A lot of 29ers have a steeper head tube angle than a 27.5, which makes it a little more business and a little less party. Wagon wheel bikes are like a luxury automobile. I like them when the terrain is fast and flowy, without a lot of sharp turns. They are also perfect for dirt road riding (for say, a Leadville 100) and for a lot of the stage races I do. I also find that 29ers are nice on loose or slippery terrain because there is a bigger rubber footprint on the ground. If your speed is high, a 29er will plow through obstacles better than a 27.5. However, once you get hung up on something, it’s more challenging to get going again, as the acceleration of a 29” wheel is slower than a 27.5” simply due to mass. Also a lot of 29ers have a steeper head tube angle than a 27.5, which makes it a little more business and a little less party. The 27.5 bike is the choice for the rowdy trails of British Columbia. The tweener wheel size is like driving a performance-tuned sports car. I prefer them when the terrain is technical and when I want a playful, responsive feel. Often technical trails are slower paced than their flowy counterparts. In other words, there’s a lot of low-speed handling. I prefer 27.5s for technical trails because it’s easy for me to keep get the wheels moving on punchy spots, rocky, or rooty terrain, or on steep climbs. It’s also easier for me to throw the bike around and use obstacles on trails to gain speed rather than plow through them. Bikes with 27.5 wheels also have a shorter wheelbase. That said, at high speeds, the 27.5 can feel twitchy compared to the 29ers and don’t carry momentum as well through fast sections. Bottom line, 27.5 is my go-to wheel size in British Columbia, and what I’m primarily riding on a daily basis. But when I go back to most places in the Southwest, I pull out the 29er. 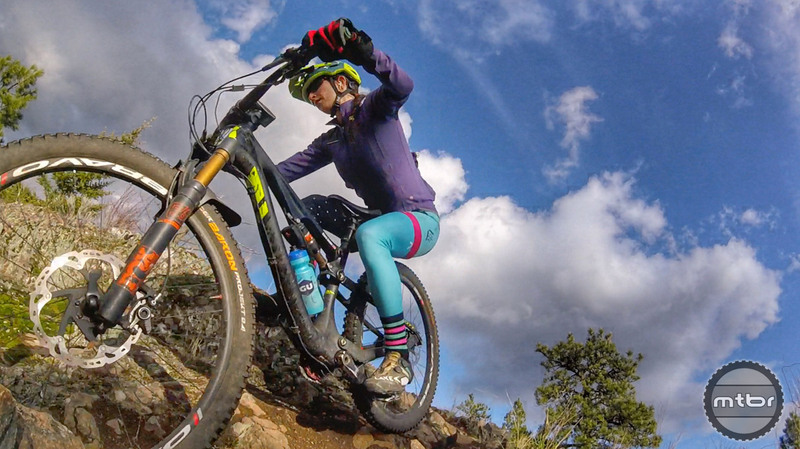 Looney prefers 27.5s for technical trails because it’s easy for her to keep get the wheels moving on punchy spots, rocky, or rooty terrain. If you are riding varied terrain that isn’t overly technical or steep, the 29er will be a nice ride. If you tend to be more aggressive and like steep, technical terrain, the 27.5 is my pick. If you’re shopping for a bike, I suggest you demo both wheel sizes and decide for yourself. No matter what wheel size you ride, it’s going to be fun. I’d love to hear what your preferences are and why, so leave a comment below. After riding a 27.5 for a couple years I just added a 29er to my quiver. I have only about a dozen rides on it but so far I have been very impressed with the handling, and agree with Achille that the feeling of the two sizes is merging. The long slack geometry and short chain stays seem to have increased both the downhill and cornering prowess of the wagon wheel bikes. That said, the new bike will accept 27.5+ wheels and I can’t wait to try out that option in the spring! Anyone doubts if a 29er can handle like a 27.5 should try a Transition Bandit, or I guess now Patrol? I have had all manner of bikes and wheel sizes since my (currently a Tallboy for XC and a Lynx for trail)… Bandit, but never one that could handle techs like that one. I think it’s all down to the design and intent. Ok, my 2 cents. I’m not going to compare a 29’er versus a 27.5 but a 29’er versus a 27.5+ since I’ve been TRAIL riding, NOT racing, both over the last couple of years. When it comes down to the SAME frameset and different wheel sizes I’ll actually take the 27.5+. Why, you ask ? 1. The 27.5+ tires give you incredible traction(wider tire) versus the narrower 29’er tire. 2. The weight difference in the two “trail” tires is negligible. 3. The 27.5+ will spin up quicker in tech situations. 4. When I get off of riding the 27.5+ tires and DO NOT feel beat-up like I do when I ride the 29’er tires. The 29’er wheel does plow through obstacles easier than the 27.5+ but I’ll take the trade-off with the better agility, traction and corning of the 27.5+ setup. Oh, and I ride in the desert southwest… rocks and mountains… lots of them ! Don’t like 29 for rear wheels. Always feel like your dragging a trailer around behind you. I love 29 fronts though. Still think for smaller ( 5’6″ or less with comparatively shorter legs) riders than 26 is still better. All my girlfriends and my bikes have 29 fronts and 27.5 or 26 rears. Front steers and rolls over everything and rear has less angular momentum , so the bike turns easier. Sally did a repeat test on her Rocky Mountain element with 29er forks and a 29 and a 27.5 wheels and same tyre ( model and widths, and yes I know that is extra biasing variables but remember the bike was designed as a 26) with 26 back wheel. Timed runs and handling feel. She liked the 27.5 better for climbing and on the descents in the tight smooth stuff. The 29 everywhere else. She rides the 29 front almost all the time. For tall riders 29 were a godsend. Saw it completely change the riding enjoyment for 2 of my very tall firends for the better. As a VERY long time track builder , I noticed a lot of tight turns start to get short-cutted as 29er’s became more common. The berms have to be higher as well to get the zero vector turns. Forgot to add. All of the above is on full suspended bikes. I have ridden 29er hardtail single speeds, and for that I do like 29 both ends, as they help rollover and speed maintenance in corners. Gearing also ceases to be relevant as you only have one anyway. I raced Cat 3 XC, in Texas, all last year on a Giant XTC 29er HT. It rolled over everything great, but was a rough ride. Fast forward to today. I just bought a Giant Anthem (FS) 27.5 So far, when riding some fast flowy sections of the local XC race course you can feel a little more when rolling over roots, BUT, the 27.5 full suspension (FS) is SO much smoother overall than the HT 29er and I have already matched or beaten my Strava segments using the 27.5. The 27.5 is definitely more agile in the twisty turns. Overall, I would suggest that either a 27.5 or 29er Full suspension will be great for most riders. I would pick a FS 27.5 over the 29er HT any day. I wish they would make a 28″ tire and get rid of 27,5 and 29. Then we’d have the best of both and not have to choose.